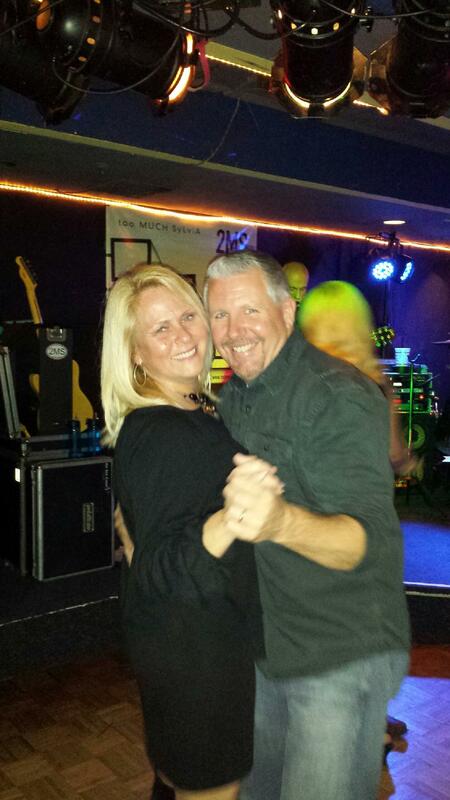 The past 6 weeks seems a blur for me, but yet so much has happened in the lives of my family. As I continue to recover from major surgery it is always great to hear the doctor say – “We did the right thing.” It was a tough decision that I made back in January but now looking back it has been a really good one for my overall health. Sometimes I wonder why God makes decisions seem so hard maybe so we can celebrate in the glory of the goodness he provides on the other side. I am blessed to have a wonderful so many friends who graciously took care of Derwin and I over those first couple of weeks. From meals to prayers we felt the abundant love so many provided for us. Many thanks to my wonderful husband who patiently took care of me over the past month as I heal and slowly regain my strength. As healing began both physically and mentally, Spring tried hard to come. Yet it is still not here to stay. Thankfully Spring showed up on an a family retreat to Savannah, Georgia where we met the girls for Spring Break and spent a long weekend enjoying beautiful weather and a beautiful city. 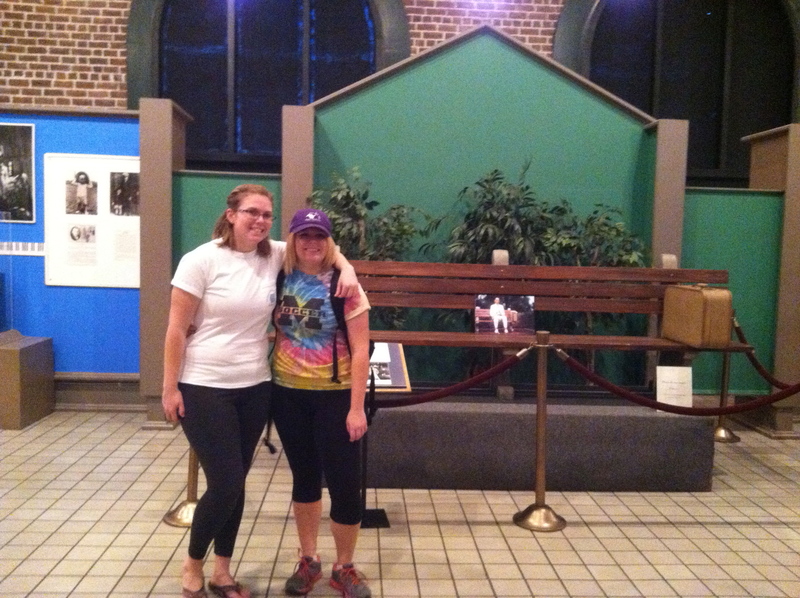 Of course one of the highlights for all us in visiting Savannah, Georgia is the bench from Forrest Gump. 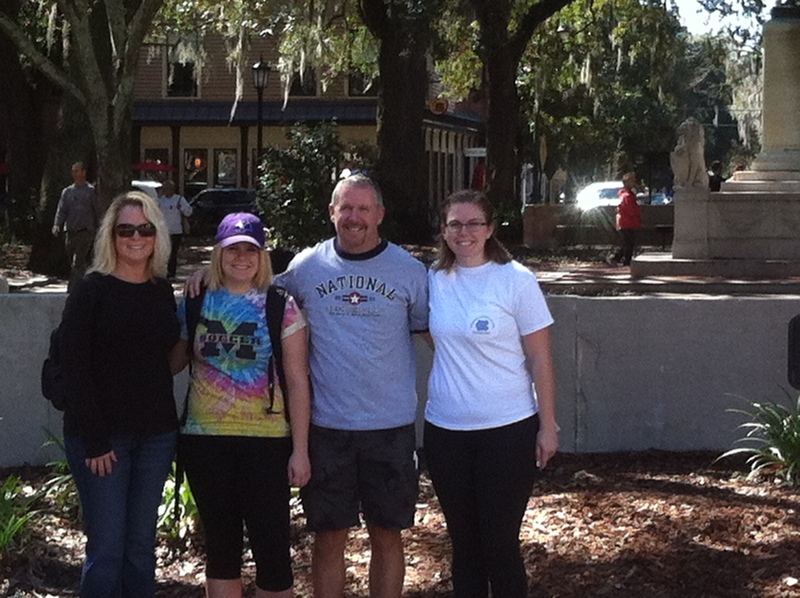 Here we are all standing at the site of where the bench sat in the movie. 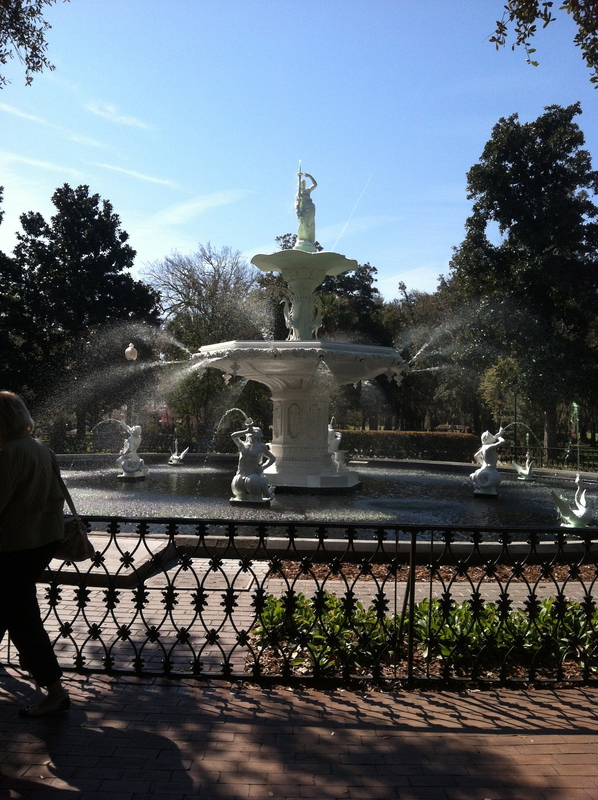 This is just one of the many beautiful parks in Savannah. 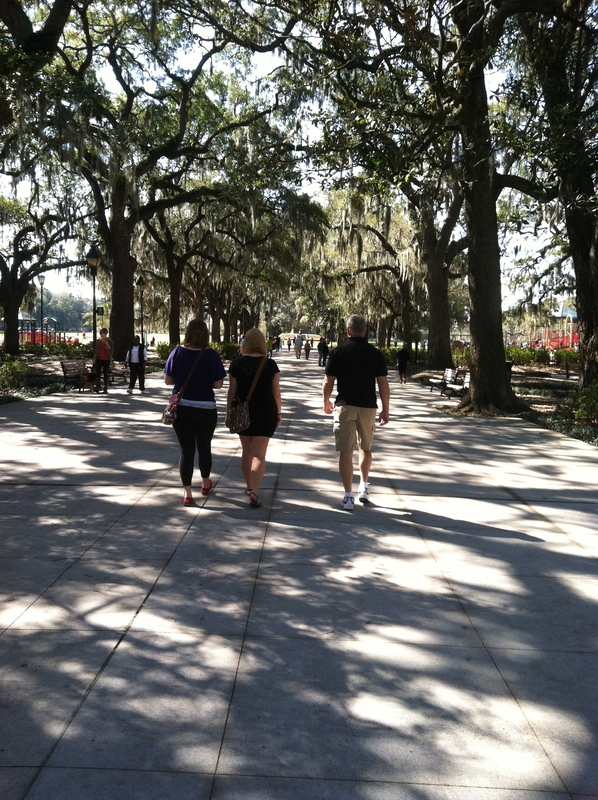 Kudos to the founding fathers who developed Savannah with the beautiful parks all around the city. We visited the weekend before St. Patricks Day and now I think visiting again for St. Patricks Day needs to make my Bucket List. The city goes all out and were definitely preparing and in the spirit while we were there. 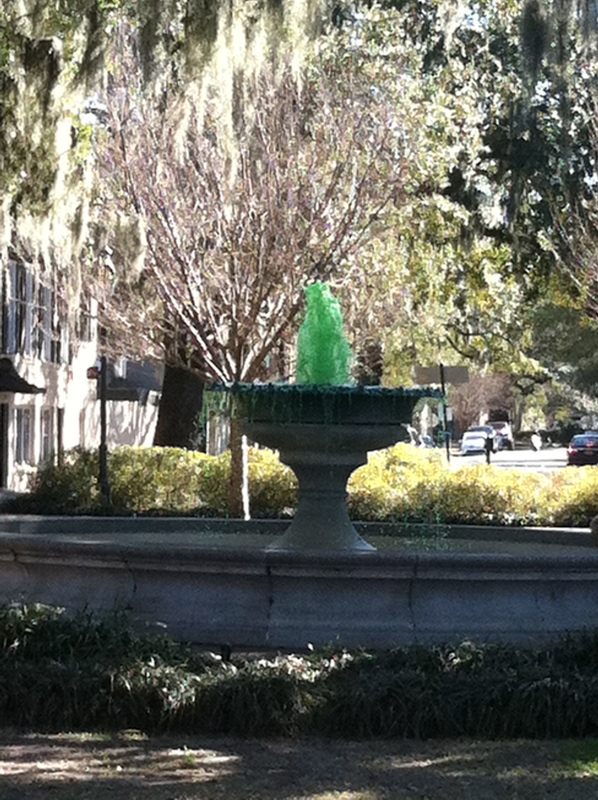 The fountains were turned green for the occasion throughout the city. We could not leave the city without finding the bench we all came to see. 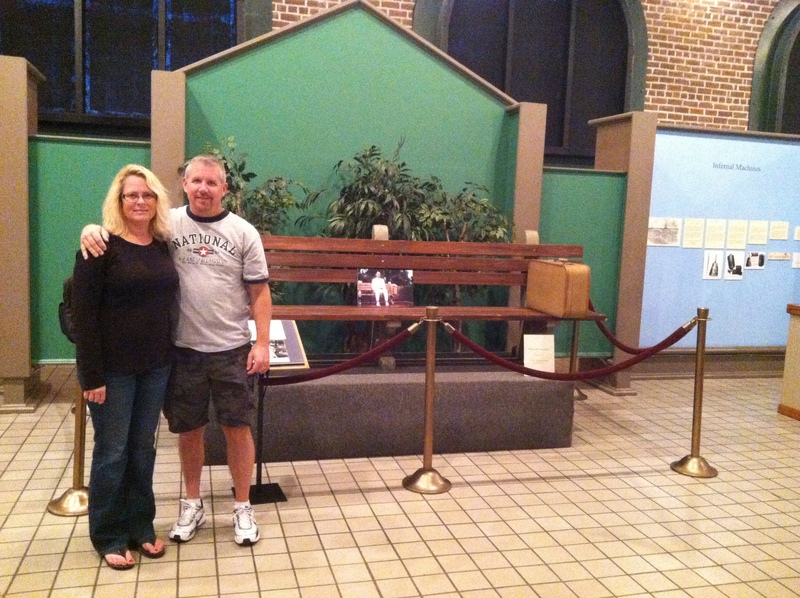 Located in the Savannah History Museum which was fascinating with all the history and development around Savannah is the infamous bench…. This was definitely one of our most memorable little weekends together. Strolling through the park are three most important people in my life! Enjoying the awesomeness of God’s beauty that day. We had celebrating to do as Jesse had just returned from Boston where she competed with the UTampa Student Model UN team and had just received word she would be an RA next year. She is excited about having that dorm room to herself. Derwin and I are proud of all her accomplishments in Tampa. She has really found her home there. Ok, she complains about the heat too much and I want to hit her often while I am freezing up here in NC. Derwin and I are watching our new home take shape and the excitement builds each time I get to walk through the new place. 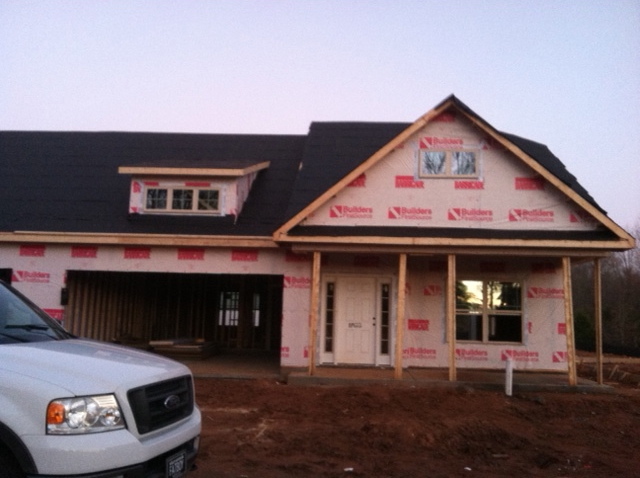 I can’t wait to enjoy the new home with all our friends and family. Looking forward to so many good times and laughs and much-needed rest for Derwin and I. Final celebration will be in May as we celebrate officially Hannah’s graduation from UNC. Derwin and I are so proud and can not wait to see her with that light blue on and officially walk out into the real world. I have been holding the post in anticipation of Hannah making her decision to accept Teach for America’s offer to both teach and begin graduate school beginning with this school year. She will be located somewhere in Eastern, NC. Again we are proud of her and her desire to continue a family tradition in Education. Derwin and I are excited that she will be beginning her own life, yet it seems strange for her to truly have a job and be out in the world on her own. I do hate tooting my own horn, but I am sure I will be scolded if I do not share the award I won from NCTIES which is a state organization for technology in education. I will just post a link to one fo the newspaper articles written below. I am thankful for all the opportunities that the Mooresville Schools have given me to work with students by providing great digital tools. I work everyday with some awesome educators who love every child, every day! Love you MMS!